In the most recent new Land Rover Discovery Sport review from Edmunds, they praise this small luxury SUV for lots of things, including its “impressively high towing capacity”—and it’s no wonder why. With a starting MSRP from just $37,795, the new Discovery Sport towing capacity comes in at a commanding 4,409 pounds. 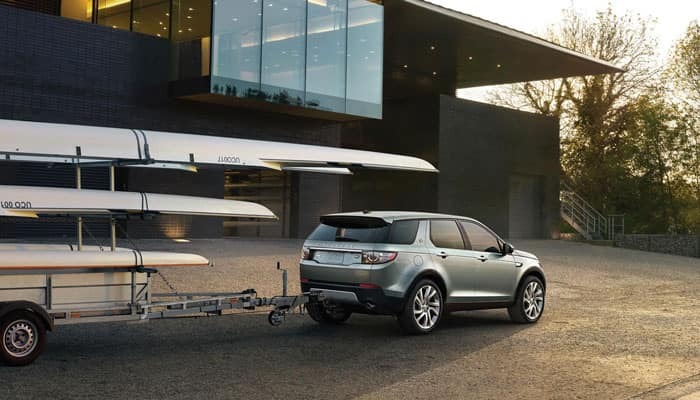 Find out more about this model’s towing capabilities, and then check out the new Land Rover Discovery Sport HSE, SE, and other Discovery Sport configurations near Glen Cove at Land Rover Freeport, where we have a number of Land Rover Discovery Sport specials going on now! The new Land Rover Discovery Sport makes it easier to tow a hefty load behind you with the help of Trailer Stability Assist (TSA), and advanced electronic trailer sway control that is designed to prevent individual wheels from slipping and correct the trailer from swinging from side to side out of the lane. It does this by reading sway, which is then corrected through the strategic and automatic delivery of brake pressure and torque reduction to specific wheels. Take advantage of any of the Land Rover Discovery Sport lease deals going on right now near Huntington at Land Rover Freeport. You can also compare the new Land Rover Discovery Sport vs. Land Rover Discovery or vs. BMW X5 to learn more, or see how Land Rover safety features can improve your drives in Great Neck. Our dealership is easy to find at 146 West Sunrise Highway in Freeport, NY, and you can contact us at (516) 935-0600 to set up a test drive during our regular sales hours, seven days a week. 0 comment(s) so far on What is the Land Rover Discovery Sport Towing Capacity?